Do you remember learning to ride a bike? I do. It’s one of my favorite childhood memories. I remember the excitement of removing the training wheels. The nervousness- would I fall? I remember my dad jogging along side, being terrified that he’d let go. Until that moment when he did and I was pedaling solo. I remember the intense feeling of accomplishment when I could finally cruise down those sidewalks on my own. It’s a memory I’ll never forget. So, when my dad offered to teach our girls to ride, I didn’t have to think about it and I am so happy that my girls will cherish those memories with their Grandpa forever. The other thing that I remember about my first bike is the banana seat with the streamers hanging from the handles. 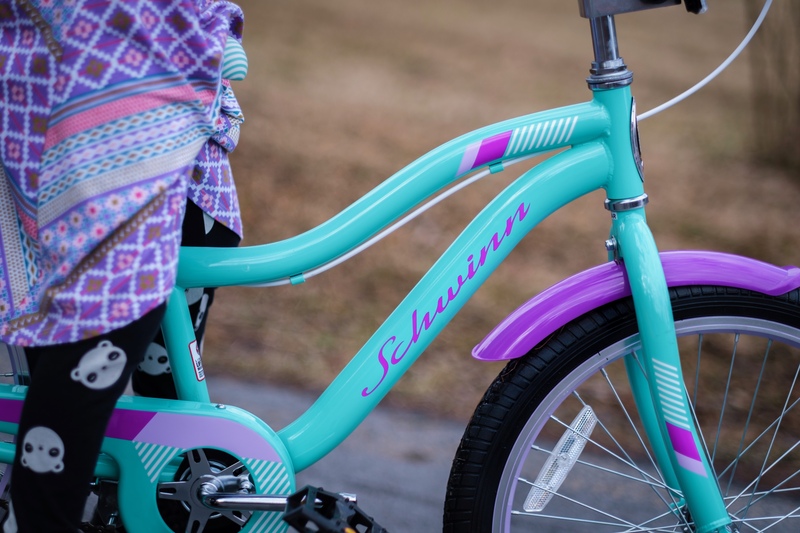 When I went to buy my oldest her first bike I was thrilled that Schwinn still makes one reminiscent of my first and under the Christmas tree it went. Several years later and my fast growing girl needed an upgrade. This Christmas Santa left two shiny Schwinn bikes under the tree for the big one and her newly training wheel free little sister. In this day and age, I feel like kids are losing basic skills. Cursive is gone from the curriculum. Basics like how to boil an egg are being taught in independent adult Ed classes. Our kids know how to tap into the deepest edges of our smart phones, but what are they missing during those hours hooked to electronics? Outdoor play, coordination, and so much more. Learning to ride my bike opened a whole new world. I could easily ride to friend’s houses and explore every nook and cranny of our neighborhood. I gained independence and confidence. I learned lessons in perseverance. I want my kids to know more than what they can learn through an article on the internet. I want them to experience the world in first person, to feel the wind in their hair, and the road beneath the wheels. Developmental. It’s been shown that riding a bicycle can boost mental awareness in children making them perform better in school. It also allows children to practice coordination and develop muscles that help with balance. You can start your kids as young as 18 months with a balance bike and given the cognitive and physical benefits, you just might want to. Exercise. Our culture has become lazy. We’re even a little lazy about exercise. Fifty plus years ago, people weren’t heading to the gym to shed the pounds. They were walking, running, biking everywhere. Keeping our kids active is a task these days, a bike makes it less of a chore and more a treat. Teaches basic life lessons. One of the most crucial lessons I learned from learning to ride was this: if you fall, you get up and try again. As much as I wish it weren’t, life is going to knock our kids over time and again. The important thing is to keep trying anyway without fear of falling. (On this topic: stay safe and alway wear a helmet while riding your bike, ours were gifted by Mini Hornit and we love them). Other life skills encouraged by bike riding: independence, exploration, perseverance, responsibility. Fun. Riding a bike is just downright fun. If I haven’t convinced you yet, this one should. And, it can be fun for the whole family if you decide to climb on and go for a ride together. I’ll never forget my miles long bike rides on the odd Saturday with my dad. I’m lucky he thought it was an important skill to share, so thank you Dad! Bike riding is essential for childhood development. From lifelong memories to outdoor play, bike riding promotes growth and healthy habits that last long after the training wheels are off. I agree with you and I can’t wait to teach my son how to ride a bike. Not only is it a healthy hobby but it’s so much fun! I remember my excitement when my trainer wheels came off and I know it will be such a milestone for my little guy too. Yes! I totally agree! Such a gift for our littles!